Loss of the important data is a nightmare for everyone. Imagine if your Blackberry devices was stolen by someone and you have important data stored on it. Do not panic! With the BlackBerry Protect, stolen BlackBerry can be tracked down. Research in Motion (RIM) as the manufacturer of BlackBerry provides an alternative to trackdown the location of stolen BlackBerry devices using an application named BlackBerry Protect. 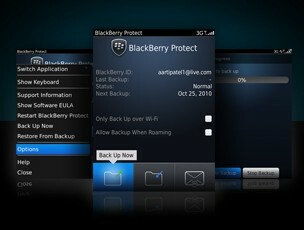 BlackBerry Protect is a free application developed by Research in Motion. Its offers many security features such as backup, lock devices, trackdown stolen BlackBerry phones, wipe phone and shipping notifications. Go to ” Find Device” option, then “View Current Location”. You will able to track the current location of your stolen BlackBerry using provided map. Well, if you want to add additional security features on your BlackBerry devices, you should install BlackBerry Protect now. Some visitor asking me to trackdown their stolen BlackBerry devices. No.. no.. I can not do such thing for you. Please read usefull links below to get more information and knowledge about Blackberry Protect features and BlackBerry Protect how-to guides. ps. You need PDF reader to read BlackBerry Protect user guide and security notes. I lost my phone exactly one week today I.e 19th of January 2013. Pls I want to track d person dt stole my phone cos he left with 8 phones and some money and I’m d only one using blackberry among us. So everyone is depending on me to help them track d person to recover all d phones. I’ve been to d site I was ask to go but after entering my username and password I could nt sign in bcos when I clicked on sign in button it wasn’t going. Please help me out. Its of no use trying to track down a stolen bberry all u need to do is just close ur eyes and buy another one..the site 4 tracking down is fucked..it works for some and others,,nonsense..am tired of tracking coz it leads to wasted effort..the security is nt strong enough..so I quit bbm 4 life…coz I just waste money on something I knw I will never find..just incase its possible here is my pin 2a29ca9c…my email csi4miami@yahoo.com thanks a lot” if u can help out..
guys is it possible to track down you stolen blackberry if u know the EMI number for it. Next story Google Policy Violating European Law?